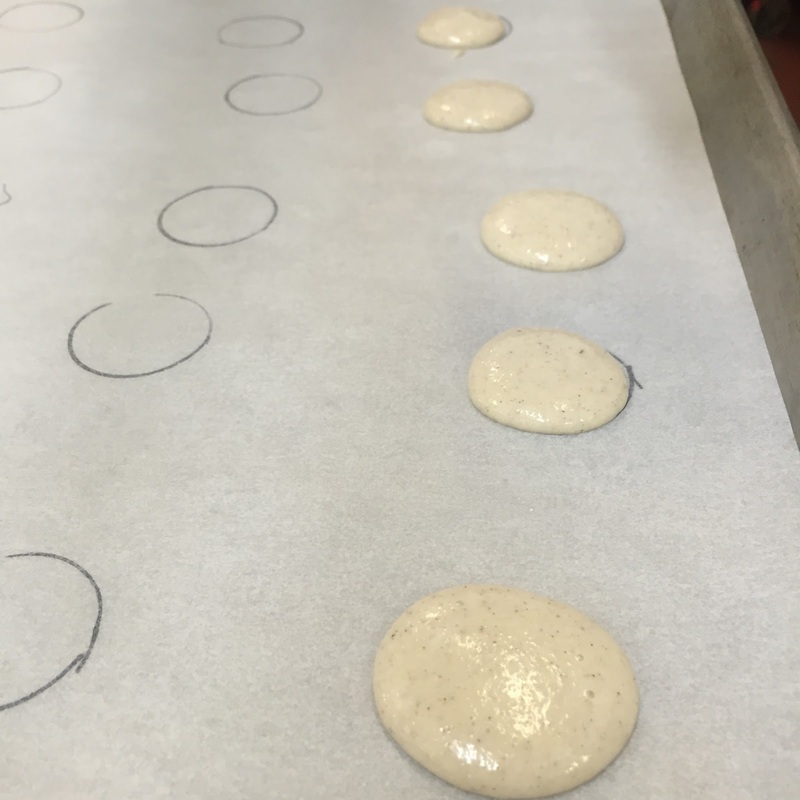 Macarons, puff pastry, chocolate mousse. This is what you think when you think fancy dessert. And these are intimidating desserts that are often only eaten out prepared by a professional. With a little practice they could be made at home as well. They all require careful attention and precise preparation. Here the creativity is in the filling flavors and serving method; the recipes are made to be followed. One misstep and you can throw off the whole batch! That's what happened with my chocolate mousse. While not ruined, it was not a textbook mousse. The first mishap was putting the vanilla extract in with the egg yolk mixture instead of the egg whites. 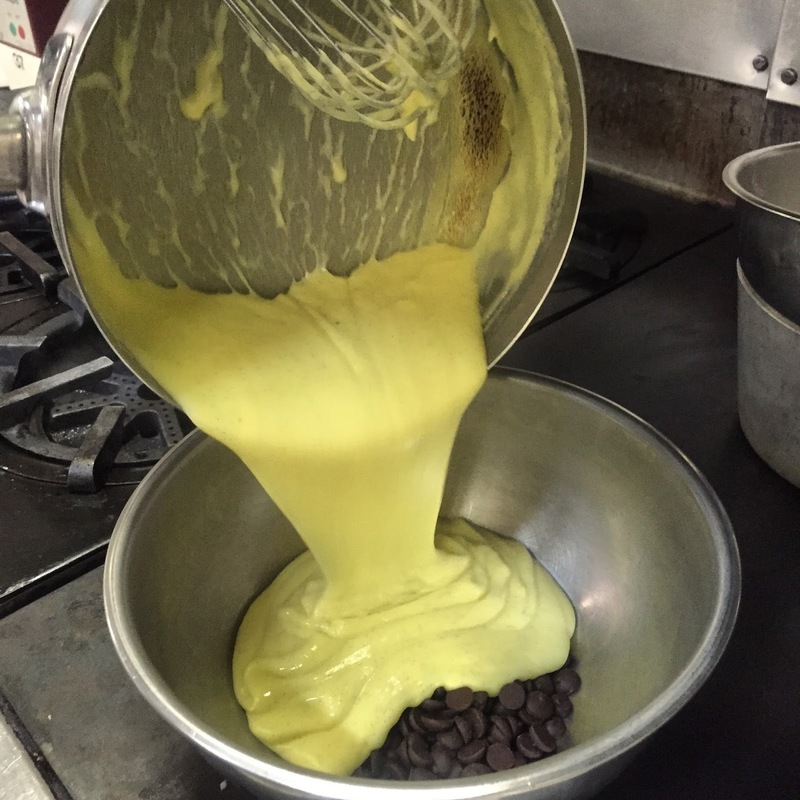 The egg yolk mixture is cooked and the vanilla loses its potency. My group remedied this by adding extra vanilla to the egg whites. My job was to beat the egg whites until just frothy in order to ensure a light and airy chocolate mousse. I turned my head for a second and they were over whipped. Oops! This meant extra work mixing them into the chocolate. This causes the air to be pushed out resulting in a more dense mousse (not light and airy). The egg whites should have been slightly under-whipped as they would get more mixing. Not to worry, Julia Child's recipe includes a good dose of dark brew coffee and a splash of rum. Even if the texture was off the flavor was right on. If this is made for a mixed crowd, be sure to use pasteurized egg whites, decaffeinated coffee, and orange juice in place of the rum. A dish that is part ready for any brunch, Dorie Greenspan's French yogurt cake is easy to prepare. The cake gets its name from the way it used to be measured in France - with a glass yogurt cup. It was eaten as an afternoon snack. 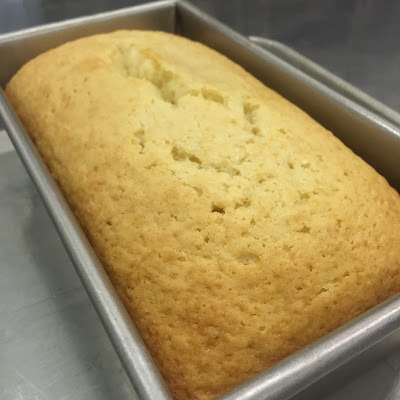 This is a versatile batter that can be baked into a loaf, an 8" x 8" cake pan, or cupcakes. All you need is to adjust the cooking time based on your chosen baking dish. A great trick we learned tonight was how to distribute the lemon flavor evenly throughout the cake. 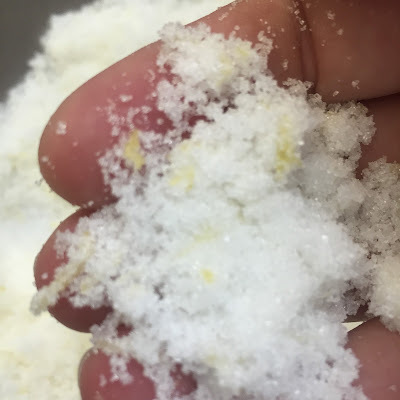 Use your hands to rub the zest into the granulated sugar until it looks wet. A second trick, or technique, for folding ingredients is courtesy of Julia Child. Take the spatula and cut the batter in half toward you, as you lift, turn the bowl. Continue this until the batter is just mixed. As our instructor would remind us, you want as little gluten development as possible. There are books and classes dedicated to making the perfect French macarons. Tonight I was expecting a learning experience - basically a macaron flop especially since it was 90+ degrees and humid. Surprise - somehow we made it happen (beginner's luck?)! What a fun night! 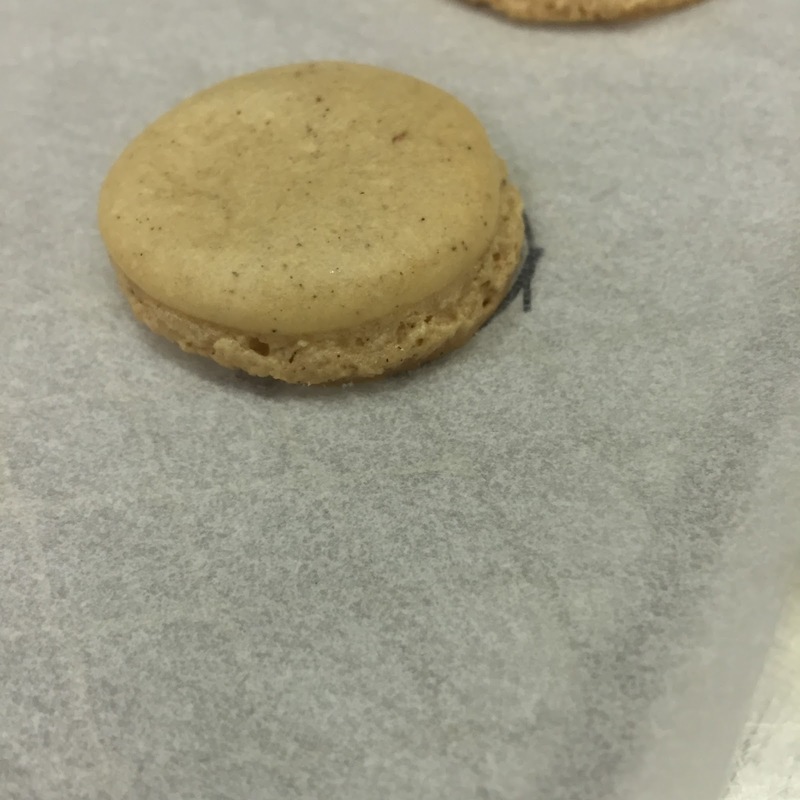 Practice will definitely make closer to perfect (I'm not sure perfection is attainable for me with these recipes). After experiencing the amount of labor that does into those petite desserts, it is easy to understand why they are so expensive at the bakery! 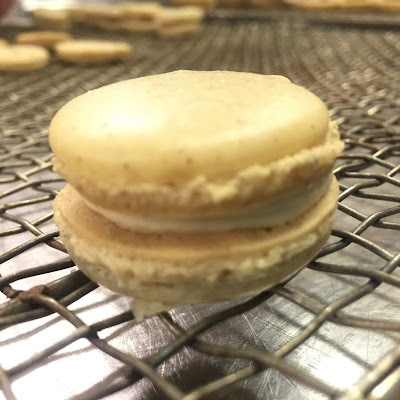 Have you made macarons? Tackled a pastry that you always buy at a bakery? I"d love to hear your story!